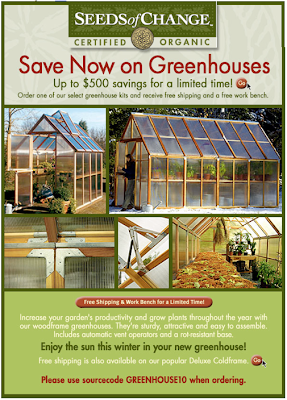 In light of the snow this morning, the greenhouse sale email from High Country Gardens was extremely well timed. I would love a greenhouse for the back of the property. Being land-rich and cash poor makes fixing up your HUGE yard a bit of a hassle, and starting plants from seed is pretty much the only affordable option. Our windowsills are already booked for the tomato and pepper seedlings, so I've yet to try planting perennials, shrubs or flowers. Thus, I dream of a greenhouse. And will keep dreaming... maybe someday. Gorgeous! It'd be easier to ignore if it was only practical. i can't wait for spring, too! warmth and flowers and growth everywhere! and thank you for leaving the etsy link to the skirt--it is SO my style! !